Mighty Himalayas are the water tower of South and Southeast Asia. More than 10 major rivers originate from Tibetan plateau - Brahmaputra, Yangtze, Mekong, Sutlej, Indus, Salween and Huang Ho (aka Yellow River) are some of them. All these rivers are critical to the life and well-being of millions of people live on their banks. 2,880km long Brahmaputra originates from Tibet. There the river is known as ‘Yarlung Tsangpo’. Total drainage area of Brahmaputra river is 5,73,394 sq.km. This river flows eastwards through southern Tibet for a distance of 1,625 km; then at its easternmost point it takes a spectacular U-turn at Shuomatan Point (aka Great Bend) and enters India’s easternmost state - Arunachal Pradesh. Here the river is known as Siang. After replenished by several tributaries, Brahmaputra enters Assam (aka Asom). Brahmaputra is the life blood of Assam; after slowly flowing through Assam, Brahmaputra enters Bangladesh. In Bangladesh, this river is known by the name Jamuna. 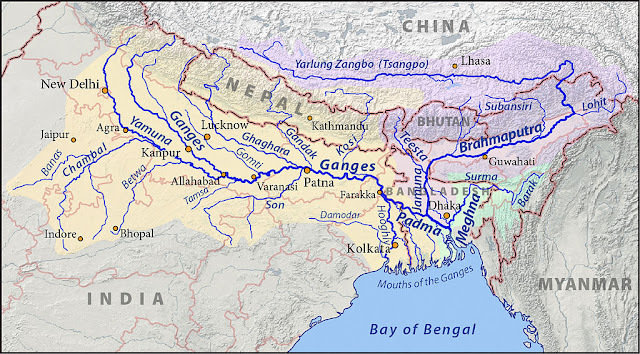 During his course in Bangladesh, Brahmaputra joins with Ganges (known as Padma in Bangladesh) and Meghna and flows to Bay of Bengal. Before embracing the sea, this combined river system creates the largest delta – Sundarbans. By the way, this river is also shared by Bhutan. In terms of water flow and length, Brahmaputra is the largest of Indian (though all parts are not in India) rivers. From time to time, this river creates floods in Assam, thereby enriching the soil in that state. As far as Bangladesh and the delta is concerned, water from Brahmaputra is their lifeblood. In a not so distant future when climate change threatens the patterns of Monsoon and many rivers are expected to go dry, Brahmaputra may be the answer – at least for some time. Declining water flow in Brahmaputra will also make its estuary more saline and adversely affects the livelihoods of millions there. Problem we are currently facing is the huge demand for water and electricity from northern and eastern Chinese cities. As population is exploding in cities of coastal China, demand for water is also rising exponentially. However, water is not something which china can manufacturing cheaply. It is altogether a different matter that, the run for becoming the manufacturing capital of world also heavily polluted most of the water resources in China. So, Chinese found a simple solution, redirect water from Tibetan plateau to coastal cities. It doesn’t matter how complex the engineering or natural calamity it is going to create. Looks like the Chinese government is almost determined to divert water from the great rivers of south to provide for hungry north and coastal area. In order to accomplish the task, Chinese government is going to create a series of dams in Brahmaputra - Zangmu, Gyatsa, Zhongda, Jiexu, Jiacha, Langzhen etc. Another solution is to break the Great Bend and let Brahmaputra flow to China (however this is a huge engineering challenge) or lift the water from Brahmaputra and move it to coastal area (this is also an engineering challenge). Chinese romanticism with huge projects and their gigantic chest of money may even make this possible. Zangmu dam is the first in the series. Built at an altitude of 3,260m, this 26-turbine dam is expected to generate 540 MW of electricity. Its height will be 116m and length 390m. This dam will have a width of 19m at top and 76m at bottom. It is believed that Jiexu, Zangmu and Jiacha are within 25km of each other and approximately 550km from Sino-Indian border. China claims that these dams are basically designed as run of the river and not meant for diverting or storing water. However, there isn’t much data available and its extreme secret nature is very much suspicious. Even if it is not meant for water diversion, these dams (for that matter dams currently under construction at Indian side of Himalaya) are extremely dangerous. Gorge of Brahmaputra is located in a highly seismic zone and prone to earthquakes. In China, there is a strong lobby advocating large dams (in India as well). They should have learned lessons from three gorges dam. 'One of the biggest changes to occur in big dams in the past 20 years is the rise of Chinese dam builders and financiers. China's dam industry has gone global, building hundreds of dams throughout Africa and Southeast Asia, but also Central Asia, South America, and the Himalayas'. From the experience of flash floods and other disasters in Uttarakhand due to immense changes in the ecosystem and frenzy dam building activities we all should have learned the lesson. Chinese should be knowing better after three gorges dam. Costly Three Gorges project was marketed as the solution for all problems and ended up as the biggest nightmare. Imagine the breakup of a huge dam in higher Himalayas. This will wipe out civilization at river banks in lower Himalayas. As we all know, Himalayas are one of the world’s youngest mountain range and highly seismic. We can’t even blame nature for disasters. Brahmaputra is not fully flows through Tibet; its waters are life blood for North-Eastern India and Bangladesh. When building dams in international rivers - that too in border areas – Chinese have to answer the concerns raised by lower riparian states. 1. Make the details and design of dam’s public; or at least share it with riparian states. 2. Let Indian officials visit the sites. After all, dams are not military bases. 3. Chinese government should publish a white paper about their future plans for Himalayan rivers. 4. We should also set up a permanent joint river commission for Brahmaputra. Commission should meet regularly (like Nile Basin Initiative or Mekong River Commission). 5. Chinese should provide year around water flow data in Chinese side of Brahmaputra to India. 6. A water sharing agreement. We should not expect that Chinese will provide the data just by asking. If that was the case, then this would have happened years ago. It is to be noted that, China has refused to join Mekong River Commission (they are only observers in the commission). In addition to that, dragon is yet to ratify UN Convention on Non-Navigable Use of International Watercourses. What more, there isn’t any water sharing agreements between Indian and China, even though many rivers critical to the very existence of Northern, Western and North-Eastern India starts from Tibetan plateau. We shouldn’t hesitate in demanding data. This is very much critical for India. PS: It is believed that - in June 2000 - a natural dam on Chinese-controlled side of Brahmaputra broke free and caused massive flooding in Arunachal Pradesh. 30 Indians killed and another 50,000 displaced from their homes. Indian authorities charged that, China had withheld vital information that could have improved flood forecasts. This finally led to 2002 agreement by which China should supply river flow data to India during flood season. Problem is, this agreement covers for 6 months only. We are still stuck there. Chinese should provide around the year data to India.